More than just photos, Joy is about your life's story and bringing generations together around those moments just like the classic album used to. At 66% larger than a personal tablet, Joy is perfect for sharing stories with loved ones. Your photos and videos come alive in beautiful layouts on the large 13.3 inch, Full HD display. Using the Joy iOS and Android apps, you can create and easily share as many albums as you like from anywhere to anyone's Joy device. Easily pull in photos from Facebook, Google Photos, Instagram and Dropbox. 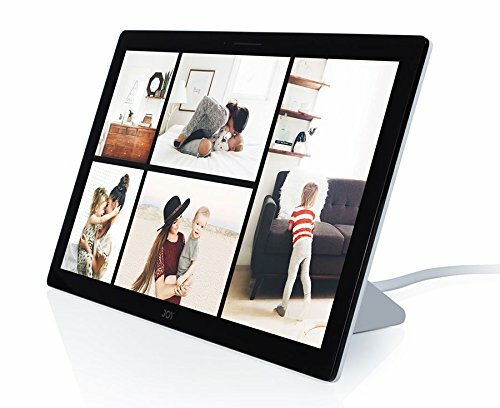 Joy not only replaces the stacks of photo-books and dusty digital photo frame from 10 years ago, it's also an all-in-one photo organizing system. With the StoryTime feature, you can gather around a photo album even when you're miles apart. Voice notes preserves the wonderful voices and narrative behind your memories. Relatives can record voice messages by simply pressing down on any photo or video. Start a voice call between two Joy devices and share your screen so it feels like you're right next to your loved ones. When it's not in your hands, Joy lives on the Wireless Charging Stand on slideshow mode. Rediscover favorite moments as they rotate through and delight everyone in the room throughout the day. The Joy Wireless Charging Stand is the world's first magnetic stand with two active charging surfaces, and intelligent auto detection. This allows Joy to go from a gorgeous display to sharing on your couch in one easy motion. With a high angle for shelves or low angle for side tables, Joy is untethered and inviting just like the photo coffee table books of days past. Meet Joy - The smart photo album. More than just photos, Joy is about your life's story and bringing generations together around those moments just like the classic album used to. A storytelling device that connects you with family whether they're at home or miles away. When it's not in your hands, Joy lives on the Wireless Charging Stand on slideshow mode. Rediscover your favorite moments as they rotate through and delight you throughout the day. Easily load albums on the Joy Photo Album with Joy's mobile or web app. Invite friends to add their pics to an album and everything is immediately viewable on your Joy Photo Album and theirs.